This trident is an exquisite weapon engraved with images of waves, shells, and sea creatures. 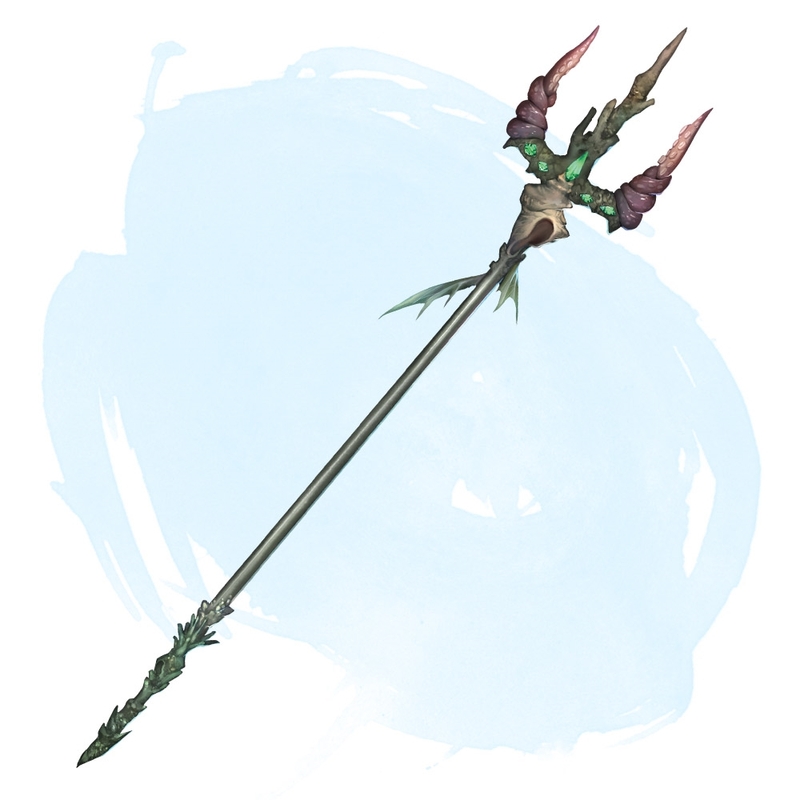 While carrying Muirgheal and being submerged, you gain darkvision out to a range of 120 feet. Dominate Beast (save DC 15) on a beast that has an innate swimming speed. Muirgheal regains 1d3 expended charges daily at dawn. If you score a critical hit with Muirgheal, the target takes an extra 1d6 necrotic damage. A creature is immune to this effect if it is immune to piercing damage or has legendary actions. While carrying Muirgheal, you can use an action to create a bubble of air around your head. It allows you to breathe normally underwater. This bubble stays with you until you spend a bonus action to remove the bubble, you are no longer carrying Muirgheal, or you are no longer underwater. While attuned to Muirgheal, you are proficient in Athletics and Nature. You also gain Expertise in Athletics (Swimming), Nature (Water). While you are attuned to Muirgheal and are moving through a body of water (GM’s discretion), you get a +10 bonus to Dexterity (Stealth) checks and can’t be tracked except by magical means. You leave no tracks or other traces of your passage. This works not just while swimming across a river, but also walking through the surf on a beach. While carrying Muirgheal, you gain resistance to cold damage. In addition, you and everything you wear and carry are unharmed by temperatures as low as -50 Celsius. While attuned to Muirgheal, you do not suffer the half movement penalty because of difficult terrain while under water. While attacking with Muirgheal, the critical hit range of the weapon is expanded to 19-20, as if the wielder had the Champion’s Improved Critical 3rd level class feature.